Fearne Cotton, Sara Cox and Roman Kemp host a night of music to celebrate the decade that saw the first BBC Children in Need major appeal. Browse content similar to Children in Need Rocks the 80s. Check below for episodes and series from the same categories and more! to the biggest party of the year. fantastic memories and eye-watering fashion. Not least from the audience, who've all dressed up for the occasion. just a little bit and lock away any sensitive pets. for a truly wonderful cause, for BBC Children In Need. to children and young people across the UK. And we'll give you all the donation details very shortly. the chap with the chat, the boy with the bants. Go wild for Mr Roman Kemp. Roman, are you all right, sir? because, as you can see, I'm joined by A-ha. Guys, hello. Very excited to have you here. -We're doing an acoustic version of Take On Me. Whoa! Hey! All still to come. Tingling nerves back here backstage. But back to you guys. appearing live on the stage tonight, we have A-ha. OMD, and UB40 featuring Ali, Astro and Mickey. What's more, we'll have some surprise special guests. Find out what a seven-year-old makes of this. And a final performance that will blow your luminous socks off. Siobhan, Keren and Sara, the mighty Bananarama! Massive thanks to the amazing Bananarama! -Wow. I always wanted to be the fourth Banana. That just confirmed it. Now's the time, Fearne! There's plenty more to come this evening. Brace yourselves for some of the biggest hits from the '80s. Tonight, we're going to party like it's 1989.
for young people and their families in desperate need of help. to be the biggest and best one yet. a brighter future for children all over the UK. So please dig deep and give as generously as you can. ..where you can also make a quick donation online. Now, tonight, we are throwing an '80s spectacular. So please help us to raise "Loadsamoney!" That's good! It was good, wasn't it? than I've had hot chicken in a basket. Scream, faint and cry a little bit. It's the heart-throb-tastic Jason Donovan! Hello, everyone. Oh, yes, that was absolutely incredible, wasn't it? But right now, super excited, I'm joined by these fabulous ladies. -I'm joined by Bananarama. Girls, how are you? That was unbelievable. Opening the show. -How did it feel going out there? so that was just a little taster, really, for us. It was great. -A little taster for Siobhan. -8,000 happy people. It was great. do you still get such a big buzz out of doing this, right? And especially for such an incredible cause. What did it mean about going out there in such an occasion? You know, you have to watch that night. It's, at turns, exciting and heartbreaking. -And I just hope everyone gives. Now, the 1980s were such a fabulous time for many different reasons. a few dodgy, you know, bits of fashion and technology. to some of the highlights. Now, that is not a reference to Simon Le Bon's hair. Look at the man. He's like this. The dancing is like the old type of dancing. Is this The Lion King or something? It's just, like, so funny. -Yeah, this is more like it. Rock was really popular at that time. -Is this a different language? They make people join in. I think they're trying to make people join in. He says, "Oh, shut up in your face." Oh, I know what this is. No, you need to take the case off. There's a case, you know. -and then put it in. -Do you have to the open this? I can't fit it in. Where am I supposed to put it? -I think this is the entertainment. -No, no, turn it round. I'll do it. I'm doing it. It looks like it has string inside it. -Put the middle in the hole. Put the middle in the hole. And then be very careful. I know how to do it. Would you let me? Just put it in now. I only can put CDs in. -No, it's like a picture. Try it in that one. I can't see the TV that well. This is the volume, this is volume. Play, play, play. Press play. I think you've murdered it! What's wrong with this thing? I hope it works because I want to see this footage. This is very weird, to normal TV. Because it's all fuzzy. My flatscreen doesn't look like this! It doesn't have the screen or anything. It's not even like a laptop. It might look like one, but it's not. offered the option of having their memories permanently wiped. Wiping their memories. Is that a link to the next song? Because here they are, it's Erasure. # Would you open your arms out to me? # What religion or reason could drive a man to forsake his lover? Thank you so much. Thank you very much. Wow. I mean, that jacket. Like some sort of shimmering '80s merman. And a voice that can shatter glass and hearts in equal measure. I love you, Andy Bell! So good. Do you reckon I can borrow that jacket off him? Love it! a huge difference to a young person's life. And, you know, that's always easier when you've got a friend. friendship is one of the most important things a child can have. friendships are starting all over the UK. No, you say me and I say you. ..crazy...and sometimes a bit annoying. This is left and that's right. -And he's great at football. guide the way to the ball. Charlie and Rudi became best friends because of Children In Need. It helps us, like, build-up our confidence. because I have a poorly head. Charlie helps me and he's my best friend in the whole world ever. a project for deaf children. Alayna and Lucy come here every week. I am Hari. This is Noor. When I first came here, I didn't know how to speak English. and when I made friends I felt normal. You never run out of stuff to do when you have friends. and it affects all my organs, mainly my lungs. it makes me not be able to go out to play with my friends. and Sophie is a befriender. She's from The Butterfly Trust. I would talk to Sophie about it. She understands what I'm going through. Children In Need has made so many friendships possible. we'd like to say a big thank you. but having friends really can make all the difference. by picking up your phone and, please, making a donation. Details are on your screen right now. who turned Sunshine into a massive worldwide hit. Please give it up for Katrina! One, two... One, two, three, ow! # And don't it feel good? Hey! # All right now And don't it feel good? -Clap your hands, come on! Sing this bit with me. # I'm on sunshine, baby Whoa! # And don't it feel good? in the '80s as part of Haircut One Hundred. Was that a burger? And since then, he's continued to grow on us. Please go wild for Mr Nick Heyward. # Your mouth is all dry, why? Oh, we are loving Nick Heyward. He's so cute. He's adorable. He's like a Care Bear in man-form! put your hands together and open your minds to Imagination. How are you feeling, Wembley? Let me see your hands in the air! I want everybody to jump when I tell you, OK? # Is it really magic in the air? # Could it be that? # Could it be a picture in my mind? Leee John in the house! Wow! I mean, Leee John showing us how it's done. that just happened. Wasn't that fabulous? -Thank you very much to the very vivid Imagination. -but I think I'm OK.
so much more than just shoulder pads and rainbow legwarmers. all thanks to your donations. SAM: Sport was the thing I enjoyed the most. That's the thing I looked forward to. It was always sport. ..it was sort of like there's nothing which I enjoy any more. Two years ago, Sam was playing in a rugby match for his local team. that Samuel had had a spinal stroke. And that it meant that he was paraplegic. and it would mean that he wasn't able to walk. How do you tell your son that? How do you go back and break that news? Then when my mum told me, I got really upset. It was hard to get to sleep that night. We just sat there, numb. loved charging about, like any other little boy? And what were we going to do? I didn't really want to do anything. I went to watch all my mates play, and I just felt so sad. Sometimes you feel really helpless. "I don't know who to turn to. Who's there to support us?" But there WAS someone there to turn to. following life-changing spinal cord injuries. I just enjoy, like, the sense of excitement. It just sprung my confidence up in a massive way. It's made me feel more like I fit in. gave him the adventure that he was after. and actually feed off some of the things that they've achieved. Through Back Up, Sam met Ella, the charity's under-18s manager. She is funded entirely by Children In Need. rather than what you've lost. SAM: Ella, she's just inspirational. She goes to different countries and she's done all this stuff. When I was over there in New Zealand, I did a skydive. why I feel like I'm so more positive now. Right, you're in control of this now, all right? We're incredibly proud of him. enjoying life, embracing life, doing what an 11-year-old should be doing. Tonight, you can help more children just like Sam. thanks to the expertise and hard work of projects like Back Up. But their amazing work does rely on your deep pockets. Yes, so please pick up your phone and spread a little happiness. ..where you can also make a donation online. a very special version of their timeless classic. Enjoy. # I'll be coming for your love, OK? # Is it a life or just to play my worries away? Thank you so much. Thank you, everyone. from Morten and the boys. lent her my home-made recording of the Sunday night Top 40 on cassette. Now, despite being born in 1998... Oh, I'm fuming. How dare she? How dare she?! # How do I get you alone? Thank you! Thank you so much. Give it up for the band. Thank you for having me. Thank you. So, George, I saw you eyeing up the game earlier on. So, I'm going to have to do this, right? So... I've got a list of hairstyles with question faces. match the hairstyle to the person. So I'm going to give you this. Well, that's definitely Bona Jovi, isn't it? What was that band from Birmingham? It was the band from Birmingham? Hold on a second. With the drummer. I can't think. I do know who they are. Do you want me to tell you the band? -Oh, I wouldn't have known! It could be, like, Bonnie Tyler, it could be my aunt. -Right, so that was Joey Tempest. That is such an iconic style, though, wasn't it? That particular look was me channelling Brooke Shields. It's amazing, I love it. You need the big, bushy eyebrows to make it work. That's Roger Taylor, isn't it, from Duran Duran? Have I got it wrong? Is it...? Oh, it's your dad! It's your dad! -Please just keep telling him he's in Duran Duran. -"He's in Duran Duran, yeah." please make some noise for UB40 featuring Ali, Astro and Mickey! celebrating its 38th live appeal. And you know what, its work has never been so important. and young people throughout the UK need our help. than their fair share of sadness, and yet still come up smiling. Now, these children are a real inspiration. Please just take a moment to watch this film and see how you can help. Harry was born in 2003. We had quite a healthy pregnancy, and had a lovely birth. while just a toddler he underwent tests to discover what was wrong. I remember going along to this clinic. And I walked into the room and it was filled with about 10 people. And they were all there because of Harry. And they said, "We've found the matter is. And I just felt devastation. Niemann-Pick is very rare, affecting only one in 120,000 people. A build-up of fats in the brain surely shuts down the body. There is no cure, and the disease is terminal. ..um, not good, then it's just disbelief. that you had a picture of in your mind, growing up. parents Fiona and Carl decided to get the girls tested. They won't leave you alone, will they, Harry?! but we didn't want to know. We didn't want to hear the words. When we got the news that she had it, it was absolutely devastating. at the age of seven, Harry's health deteriorated quickly. What's she doing to you, Harry? he was struggling, really struggling to breathe. He passed away in our arms, didn't he? In the bed. These two are of Harry, but that was when he was in hospital. I like having them because I can just remember him by them. I think Emily likes to keep his memory alive. She always has done. She's never stopped talking about him. because one night I just wanted to stay in Harry's bed. So my mum let me. And we were just up all night giggling at each other. This is a photo of me and Grace. and I have one in my room. Emily and Grace are now 12.
the disease has started to take its toll on Grace. -It's been quite sudden with Grace. She's struggling now to even lift her arms. She started to lose her ability to walk probably a year and a half ago. She was still on her feet a year and a half ago. You can tell when she's being cheeky with her eyes. She's never grumpy. been in touch with the charity Niemann-Pick UK. for sufferers and their families. I couldn't imagine not having the charity, really. I think we'd feel so isolated. understand and cope with the disease. but there are developments, there are treatments, and hope. And you can't take hope away from families. And we need to support them in every way, in every aspect we can. for a conference, a vital space for families to bond. She's grown quite a lot. yet so much strength and courage from the family. so please give generously and give now. You can choose to donate £5, £10 or £20. and if you don't have a mobile you can go online and donate. from one of the country's best loved singers. for the glorious Mica Paris! Rubik's Cubes and glamorous music. We had some of the greatest television moments ever made. Yes, while Frankie said, "Relax, don't do it,"
the pupils of Grange Hill said, "Leave it out, Tucker,"
and, "I only want to help you, Roland!" The series ran for 30 years, and over 600 episodes. And yet, one mystery was never solved. Who threw the sausage on the fork? Oh, no, I missed my bus! -How do you pronounce that? "Gran-gee"? "Granj"? Maybe they're saying no for not going to the gym. Wow! That sausage was on that fork, but who threw it? where are Zammo, Roland, Mrs McClusky, Fay and Tucker now? Well, I'm delighted to tell you, ladies and gentlemen, they are here! Alison Bettles and Todd Carty! It's lovely to have you here. As everyone else thinks as well. Lee, we saw the Just Say No video there. How important do you think that was in the 1980s? and the Grange Hill campaign brought that to light. Hello! Look, the ladies still love Todd! I'm sure you'll enjoy seeing this again. Have a quick look, you'll be thrilled. # We couldn't do the show without him! From you, mainly. How do you feel seeing that again? Very old, at the moment, but it was great. and I've never looked back since. -Could be time for a cheeky rerelease, possibly. Gwyneth, what were your fondest memories of working on Grange Hill? I got to be employed for 10 years, the whole decade. and keep them in order. And thank you for watching. Erkan, I mean, what a pleasure to meet you. BBC Children In Need tonight? I mean, this is an amazing night, amazing crowd. I love that Roland goes rock. Alison, tell us, highlights so far. What are you excited about? Did you go all of a-quiver at Morten Harket? I just have to say, everything has been amazing. and support such a fantastic cause. Yes, and there's still loads to come, isn't there, Fearne? There is. Thank you so much, you lovely people. The cast of Grange Hill! and a band who took synthpop to whole new levels of sophistication. # Enola Gay Is mother proud of little boy today? though I think she just wandered in by mistake. I'm into it, I like that look. Let's see what's happening backstage. Roman, how are you getting on? I'm very, very excited. What an amazing show so far. All of those guys out there looking incredible. Love the pirate hats, to be honest. Right now I'm joined, of course, by the legendary Europe. Guys, how are you? Feeling good today? Feeling good, it's great to be here. and doing this for Children In Need. What does it mean being here for you guys? and Children In Need is a big thing. -Yes. And now, guys, you are closing the show today. What does it mean to be closing the show with such a big number? any show, I would say. That's it. You heard it from the guys themselves. The Final Countdown is nigh, it's very close. Can't wait to see these guys. Europe are going to be on stage. Roman, thank you very much. and even more so when they lose someone close. times by reaching out, listening, and sometimes just by being there. Here's a story of two incredible young people called Amy and Greg. but they are rebuilding their lives and treasuring their memories. I think the thing that I miss the most about my mum is her hugs. and then it'll just instantly drag back to Mum. by the news that their mum, Dawn, had ovarian cancer. has got this horrendous disease. And then we had to sit down and tell the kids. And I would say that's the worst hour of my life. and that she would not recover. she wouldn't eat much. It was quite scary. and I didn't want her to know how much it, like, hurt. she was moved into Rowans Hospice for her end-of-life care. were introduced to Sophie, who runs the Meerkat Service. when there is so much grief can be overwhelming for children. the complicated emotions around death. that she did make it to Christmas Day before she passed. Dad picked up the phone and left the room. None of us really said anything. And then he came back in and he just said that she'd gone. And that she wasn't with us any more. I don't want to say relief, but that she wasn't suffering any more. That she wasn't in pain. My whole body kind of felt numb. You don't really know how to feel when you find out stuff like that. the Meerkat Service, taking part in group and one-to-one sessions. It can be the littlest thing, but it triggers a memory. the deep emotional trauma of losing a loved one. And I guess sadness can be a mixture of feelings as well. a significant other person for a child. they can manage what's happened. They come out of every one of these sessions with smiles on their faces. I think it's doing them the world of good. was...one of the best feelings. Without the Meerkat Service, I don't know where we'd be now. helping them to pick up the pieces and rebuild their lives. so please pick up your phone and make a donation. the terms and conditions, are on your screen now. We have something really rather majestic for you now. A legend of British pop music paying tribute to a much-missed superstar. 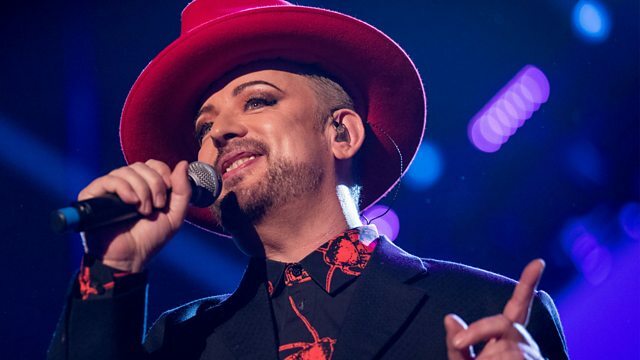 the unstoppable, untouchable, the one and only Boy George! Let me hear you, Wembley! it's not quite over yet. all of the artists, bands and singers who appeared tonight. To Steve Sidwell and his band. and being so brilliant. Thank you, guys. this Friday, live on BBC One. There's an exceptional line-up, and trust me, you don't want to miss it. Now, if you have already given this evening, thank you so much. of tonight's artists by just giving whatever you can right now. we have an iconic band performing the ultimate '80s anthem. # To earth, who can tell? # Will things ever be the same again? Come on, sing it, sing it, sing it! A star-studded line-up celebrates the decade which saw BBC Children in Need's first major appeal. Hosted by Fearne Cotton and Sara Cox, with Roman Kemp capturing all the excitement backstage, this spectacular fundraiser includes performances from a-ha, Bananarama, Boy George, Erasure, Europe, Imagination, Jason Donovan, Katrina, Louisa Johnson, Mica Paris, Nick Heyward, OMD and UB40 featuring Ali, Astro and Mickey. So dust off your shoulder pads, pull on your legwarmers and join in with the audience, who will be dancing the night away to a whole host of 80s classics.